What are thoracic outlet syndrome risk factors? What are thoracic outlet syndrome symptoms and signs? What tests do physicians use to diagnose thoracic outlet syndrome? What is the treatment for thoracic outlet syndrome? What are medications for thoracic outlet syndrome? Is surgery necessary for TOS? What are home remedies for thoracic outlet syndrome? What types of doctors treat thoracic outlet syndrome? What is the prognosis for thoracic outlet syndrome? Is it possible to prevent thoracic outlet syndrome? Thoracic outlet syndrome is a condition whereby symptoms are produced from compression of nerves or blood vessels, or both, because of an inadequate passageway through an area (thoracic outlet) between the base of the neck and the armpit. impaired circulation to the extremities (causing discoloration). Diagnosis of thoracic outlet syndrome is suggested by the symptoms and physical findings and is sometimes supported by nerve conduction and/or radiology tests. Treatment of thoracic outlet syndrome usually involves physical-therapy exercises and avoiding certain prolonged positions of the shoulder. 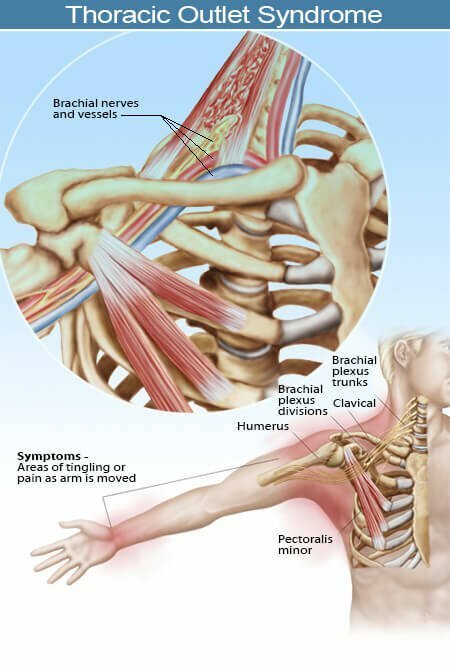 Thoracic outlet syndrome (TOS) is a condition whereby symptoms are produced (such as numbness in fingers, pain in shoulder, arm, and neck) due to compression of nerves and/or blood vessels in the upper chest. The passageway for these nerves and blood vessels to exit the chest and supply the upper extremities is referred to as the thoracic outlet. Muscle, bone, and other tissues border the thoracic outlet. Any condition that results in enlargement or movement of these tissues of or near the thoracic outlet can cause the thoracic outlet syndrome. These conditions include muscle enlargement (such as from weight lifting), injuries, an extra rib extending from the neck (cervical rib), weight gain, and rare tumors at the top of the lung. Often no specific cause is detectable. It is felt by some scientists that the evolution of the torso of primates from a four-legged to a two-legged position may predispose humans to the development of thoracic outlet syndrome. The resulting vertical posture produced flattening of the chest cage and a shift of the shoulder joint backward, both of which narrowed the thoracic outlet. My symptoms started off somewhat vague. I had taken on a new position at work that required a lot of time on the computer. I began having pain on my right side in my neck and shoulder with tingling in my hand at the end of the day. An inadequate passageway for nerves and blood vessels as they pass through an area (thoracic outlet) between the base of the neck and the armpit causes thoracic outlet syndrome. This can be constant or intermittent. Thoracic outlet syndrome can be caused by weight lifting, obesity, tumors in the chest, and extra ribs extending from the seventh cervical vertebra at the base of the neck. Risk factors include occupations that involve heavy usage of the upper extremities against resistance, including jack-hammer operators and dental hygienists, weight lifting, pregnancy, and obesity. Any condition that causes encroachment of the space for the brachial plexus at the thoracic outlet can lead to thoracic outlet syndrome, including poor posture. Symptoms include neck, shoulder, and arm pain, numbness in the fingers, or impaired circulation and flushed sensations to the extremities (causing discoloration). The involved upper extremity can feel weak. Often symptoms are reproduced or worsened when the arm is positioned above the shoulder or extended. Patients can have a wide spectrum of symptoms from mild and intermittent to severe and constant. Pains can extend to the fingers and hands, causing weakness. The diagnosis of thoracic outlet syndrome is suggested by the symptoms and supported by findings of the doctor during the examination. Certain maneuvers of the arm and neck can produce symptoms and blood vessel "pinching," causing a loss of pulse. This includes the Adson's maneuver, whereby the examiner moves the shoulder joint into positions that can cause pinching of both the nerves and artery to the tested arm. Further supportive testing can include electrical tests, such as electromyogram (EMG) and somatosensory evoked responses (although these may not be positive in all patients). Some patients can have angiogram X-ray tests that demonstrate the pinched area of the blood vessel involved. Treatment of the thoracic outlet syndrome can usually be successful with conservative measures. Treatments include a variety of exercises that effectively stretch open the tissues of the thoracic outlet. These are done with and without weights in the hands to pull the outlet into a "relaxed" open position. Physical therapists are specially trained in the instruction of exercises for thoracic outlet syndrome, and their evaluation of the patient can be helpful. Shoulder-shrug exercises and others can be done at home or at work to relax the muscles around the thoracic outlet. A health care professional might prescribe medications to help improve the symptoms, such as anti-inflammatory medications (ibuprofen [Advil], naproxen [Aleve]) and muscle relaxants. Some patients with severe, resistant symptoms can require surgery to open the thoracic outlet. These procedures include interruption of the scalene muscle (scalenotomy) and removal (resection) of the first rib in order to spare injury to the affected nerve and blood vessels from ongoing compression. Thoracic outlet syndrome that affects the vascular system (veins and arteries) is more likely to require surgery to resolve the symptoms. Patients should avoid prolonged positions with their arms held out or overhead. For example, it is best to avoid sleeping with the arm extended up behind the head. It is also helpful to have rest periods at work to minimize fatigue. Weight reduction can be helpful for obese patients. Patients should avoid sleeping on their stomach with their arms above the head. They should also not repetitively lift heavy objects. Doctors who treat thoracic outlet syndrome include general physicians, such as general-medicine doctors, family medicine doctors, and internists, as well as rheumatologists, physical-medicine doctors, and chest surgeons. Most people with thoracic outlet syndrome can have complete resolution of symptoms with conservative measures, including exercises specific for thoracic outlet syndrome, physical therapy, and avoiding stressing the tissues of the thoracic outlet. It can be helpful to avoid sleeping with the arms extended above the head. Rarely, surgical intervention can be necessary to take pressure off of involved nerves and blood vessels. Complications include embolization to the hand and nerve damage to the extremity involved. It's possible to prevent thoracic outlet syndrome by maintaining relaxed tissues of the upper chest. This can involve prevention exercises, stretches, and therapies designed to loosen the tissues around the shoulders and neck. What were the symptoms of your thoracic outlet syndrome? What kinds of treatment or therapy have you received for thoracic outlet syndrome? What tests were used to diagnose your thoracic outlet syndrome? What caused your thoracic outlet syndrome? What is chronic pain syndrome (CPS)? See causes, symptoms and treatment options including medications. Learn about pain management tips such as strength training, biofeedback, and yoga, as well as forms of chronic pain such as lower back pain, arthritis, migraines, and more. Raynaud's phenomenon is characterized by a pale-blue-red sequence of color changes of the digits, most commonly after exposure to cold. Occurring as a result of spasm of blood vessels, the cause is unknown. Symptoms of Raynaud's phenomenon depend on the severity, frequency, and duration of the blood vessel spasm. Treatments include protection of the digits, medications, and avoiding emotional stresses, smoking, cold temperature, and tools that vibrate the hands.